Tin Candle, Tea Lights: Aroma Naturals, Way Out Wax, Aloha Bay! • Citronella Plus SAY GOODBYE TO BUGS Large Soy Tin: Our Citronella Plus Large Tin is the perfect to-go and travel candle for outdoor meal or entertaining with friends and family. Each natural, hand-crafted artisan Citronella Plus candle is authentically unique with a mosaic mix of 100% essential oils. Keep bothersome pests away the natural way! Enjoy your outdoor ambiance even more by burning Citronella Plus all-natural, handcrafted soy candles formulated with 100% essential oils to keep bothersome mosquitoes and other flying insects away. Color - Silver Tin with Cream Mosaic wax. Approximate burn time is 40 hours. BUY NOW! • Detox-It Home and Office: Detox-it for the Home/Office is made with Beeswax, Essential Oils and all Natural Plant Aromas helps remove heavy odors in your home from cooking, cigarettes, daily activities or musty scent from your work environment. Ions are molecules that have gained or lost an electrical charge. They are created in nature as air molecules and break apart due to sunlight, radiation, and moving air and water. They are also known to "Bee" present in Beeswax, where the use of unscented Beeswax Candles around food works effectively to rebalance cooking and food odors. Negative Ions for Positive Results Fast! Approximate burn time is 15 hours. 2.8 oz. ORDER NOW! Ingredients: Beeswax, Lime, Organic Oregano, Organic Peppermint, Tea Tree Oil, Fresh Basil, Lavender, Eucalyptus, Rosemary & Thyme. CANDLES: Detox-It Home and Office, 15 hours, 2.8 oz. Soy Vegepure Small Tin: Our portable soy wax travel tins provide instant aromatherapy anywhere you go. Perfect for traveling or to take to the office. Discover how essential oil aromas from plants help to revitalize stale surroundings and create home comfort away from home. Our candles are made with 100% plant aromas, known as essential oils to enchance wellness. Soy Vegepure is a blend of soy and vegetable waxes. This vegetable blend burns more evenly than a "soy only" wax. These natural and unique custom blends provide the pure, fresh aromas in our candles. • Peace Ruby (Orange Clove Cinnamon): Sweet, uplifting Orange, revitalizing Clove and restorative Cinnamon have been traditionally used to relieve stress and provide comfort in the home. This festive favorite is both uplifting and revitalizing while bright Orange soothes and calms. Color: Red. Approximate burn time is 15 hours. 2.6 oz. ORDER NOW! • Wish (Peppermint Vanilla): Peppermint revives and lifts the spirits while Vanilla is comforting and enticing. Loved for its calming and familiar warm aroma, Vanilla is the under-note mixed with the refreshing and stimulating Peppermint. Color: Snowflake White. Approximate burn time is 15 hours. 2.6 oz. ORDER NOW! Soy VegePure Travel Tin: Our portable soy wax travel tins provide instant aromatherapy anywhere you go. Perfect for traveling or to take to the office. Discover how essential oil aromas from plants help to revitalize stale surroundings and create home comfort away from home. Soy Vegepure is a blend of soy and vegetable waxes. This vegetable blend burns more evenly than a "soy only" wax. It is also a different "burn" than a paraffin candle and may occasionally drip. With extra care and attention to how the candle is burning, as well as trimming the wick prior to relighting, you can experience a high quality and clean burning candle. • Ambiance (Orange Lemongrass): (Color: Lemon) A revitalizing blend of sweet, radiant Orange is combined with refreshing, energetic Lemongrass. 2.5 oz. Approximate burn time 15 hours. BUY NOW! • Clarity (Orange, Cedar): Joyful, sweet Orange combined with stimulating and elevating Cedar has an opening effect on the mind that reduces anxiety and is rejuvenating. 2.5 oz. Approximate burn time 15 hours. BUY NOW! • Meditation (Patchouli, Frankincense): (Color: Pearl) Beautiful hand-poured crystal glass magnifies the alluring glow of the flame. Patchouli is grounding and balancing while Frankincense has been use in spiritual settings for over 3,000 years. Together they are meditative and mystical. 2.5 oz. Approximate burn time 15 hours. BUY NOW! • Peace Pearl (Orange, Clove, Cinnamon): (Color: Pearl) A traditional favorite. Sweet uplifting Orange, revitalizing Clove and spicy Cinnamon fills your home with comfort and warmth.2.5 oz. Approximate burn time 15 hours. BUY NOW! • Relaxing (Lavender, Tangerine): (Color: Tangerine) Lavender is one of the most calming essential oils. In combination with soothing Tangerine, this is a peaceful aroma to reduce stress. 2.5 oz. Approximate burn time 15 hours. BUY NOW! • Romance (Jasmine, Ylang Ylang): (Color: Dark Raspberry) The powerful aroma of luxurious Jasmine combined with euphoric Ylang Ylang are blended to enhance a romantic atmosphere. 2.5 oz. Approximate burn time 15 hours. BUY NOW! • Serenity (Lavender, Ylang Ylang): (Color: Pearl) The calming benefits of Lavender are blended with hypnotic Ylang Ylang to enhance inner balance and well-being. 2.5 oz. Approximate burn time 15 hours. BUY NOW! • Tranquility (Wildcrafted Lavender): Lavender is one of the most versatile and highly regarded essential oils. Known for its calming and healing benefits, it has a pure aroma that is floral yet herbal. 2.5 oz. Approximate burn time 15 hours. BUY NOW! • Verbena (Litsea Cubeba, Bergamot): This favorite fragrance is both refreshing and uplifting. Calming Litsea Cubeba elevates the spirit, while soothing Bergamot brightens. Verbena is perfect for stress relief. 2.5 oz. Approximate burn time 15 hours. BUY NOW! • Smoke Odor Exterminator Travel Candle Tin - Clothesline Fresh: Fragrance to remind you of beautiful blue spring skies, crisp spring air and the fresh clean smell of laundry sun drying on the clothesline.The paraffin and soy blend jar candle is perfect for eliminating your Smoke, Pet and Household Odors. Simply light and the special enzyme formulation will remove smoke, pet and household odors while leaving a refreshing fragrance behind. The travel candle has the same powerful enzyme formulation as the jar candle but comes in a handy silver tin perfect for taking with you. Great for hotels, office spaces and vacation homes or anywhere else they may need odor exterminated! Candle burn approximately 20 hours. 5 oz. Made in the USA. BUY NOW!. 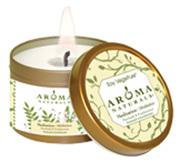 CANDLES: Smoke Odor Exterminator Travel Candle Tin / Clothesline Fresh, 20 oz. Pure Beeswax Candles Tea Lights: • 100% pure beeswax is the purest and most natural of all waxes. • Our candles have a beautiful Warm Amber Glow. There is nothing quite like the warm amber glow of a 100% pure beeswax candle. • Burning 100% pure beeswax candles can help improve indoor air quality by producing negative ions and can greatly reduce dust and other allergens in your home. • Naturally burns up to three times longer than paraffin. • Non-allergenic and recommended by the American Lung Association. 100% pure beeswax is best for those with allergies or sensitivities to scents. • The sweet honey aroma of 100% pure beeswax fills the air without added fragrance and dangerous toxins. • When trimmed correctly, 100% pure beeswax candles are virtually dripless when burned in a draft-free environment. 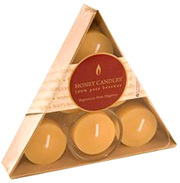 • Honey Candles® are very high-quality with a depth to the finish many other beeswax candles lack, the candles are smooth with no flakes, cracks or white spots. They make an elegant addition to your home or as a special gift for someone you cherish! • Tea Lights w/ Clear Cup: A customer favorite, Tealights are multi-purpose and very versatile. Place a few around the bathtub and let the soft amber light sooth you. Because 100% pure beeswax Honey Candles® are a natural air purifier, you can lessen dust and other allergens in your home by simply lighting a few Tealights around the house. Burn Time: 4-5 hours. Measures 1" x 3" x 4¾". 6 Pack. ORDER TODAY! • Tea Lights w/ 1 Glass Holder: This unique triangle pack makes for a great gift. The glass cup is reusable. A customer favorite, Tealights are multi-purpose and very versatile. Place a few around the bathtub and let the soft amber light sooth you. Because 100% pure beeswax Honey Candles® are a natural air purifier, you can lessen dust and other allergens in your home by simply lighting a few Tealights around the house. Burn Time: 4-5 hours. Measures 1" x 6" x 6". 6 Pack. ORDER TODAY! Tea Lights: GMO-Free Soy Wax. Made with Pure Essential Oils. Four 1.5" candles. 0.6 oz. each, Net Wt. 2.4 oz. • Tea Light Citrus Harmony: Enriching blend of Orange, Grapefruit and Clove reawakens the spirit and stabilizes the emotions. Four 1.5" candles. 0.6 oz. each, Net Wt. 2.4 oz. ORDER NOW! • Tea Light Lavender: Soothing Lavender calms and opens the heart, and relieving tension. Four 1.5" candles. 0.6 oz. each, Net Wt. 2.4 oz. ORDER NOW! 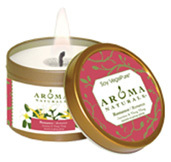 • Tea Light Northern Forest: Grounding blend of Cedar, Spruce and Fir fortifies the spirit and clears the mind. Four 1.5" candles. 0.6 oz. each, Net Wt. 2.4 oz. ORDER NOW! • Tea Light Patchouli: Awakening Patchouli kindles the sense with a musky, earthy fragrance. Four 1.5" candles. 0.6 oz. each, Net Wt. 2.4 oz. ORDER NOW! 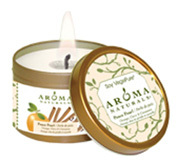 • Tea Light Cozy Home: Warming blend of Cinnamon, Clove and Nutmeg awakens nostalgia and pleasant comfort. Four 1.5" candles. 0.6 oz. each, Net Wt. 2.4 oz. ORDER NOW! • Tea Light Sweet Dreams: Comforting blend of Lavender, Lemongrass and Marjoram pacifies the nerves and releases tension. Four 1.5" candles. 0.6 oz. each, Net Wt. 2.4 oz. ORDER NOW! • Tea Light Clear Head: Revitalizing blend of Eucalyptus, Peppermint and Rosemary unlocks the mind and promotes focus. Four 1.5" candles. 0.6 oz. each, Net Wt. 2.4 oz. ORDER NOW! • Tea Light Escentual Love: Sensual blend of Lavender, Rosewood and Patchouli kindles passion and inspires romance. Four 1.5" candles. 0.6 oz. each, Net Wt. 2.4 oz. ORDER NOW! • Tea Light Sage: Purifying Sage calms emotions with an uplifting herbal fragrance. Four 1.5" candles. 0.6 oz. each, Net Wt. 2.4 oz. ORDER NOW! • Tea Light Fragrance Free: Clarifying fragrance-free offers ambiance without aroma. Four 1.5" candles. 0.6 oz. each, Net Wt. 2.4 oz. ORDER NOW! Unscented Tea Lights: Purify your home naturally with the crystalline splendor of fragrance free palm wax tea light candles. 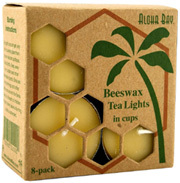 Aloha Bay Unscented Tea Light is made of Eco Palm Wax sourced from sustainable, socially responsible, and certified organic palm groves in South America. Each box contains 12 Tea Lights in aluminum cups and feature pure cotton wicks for a clean and steady burn. • Cream: 100% Vegetable Palm Wax. 0.7 oz. Burn time 5 hours. 12 Tea Lights. ORDER NOW! • Green: 100% Vegetable Palm Wax. 0.7 oz. Burn time 5 hours. 12 Tea Lights. ORDER NOW! • Red: 100% Vegetable Palm Wax. 0.7 oz. Burn time 5 hours. 12 Tea Lights. ORDER NOW! • Violet: 100% Vegetable Palm Wax. 0.7 oz. Burn time 5 hours. 12 Tea Lights. ORDER NOW! • White: 100% Vegetable Palm Wax. 0.7 oz. Burn time 5 hours. 12 Tea Lights. ORDER NOW! • Beeswax Tea Lights: Aluminum cups and pure cotton wicks. Burn Time 5 Hours.